Gear up, fan up, and get ready – football is back! 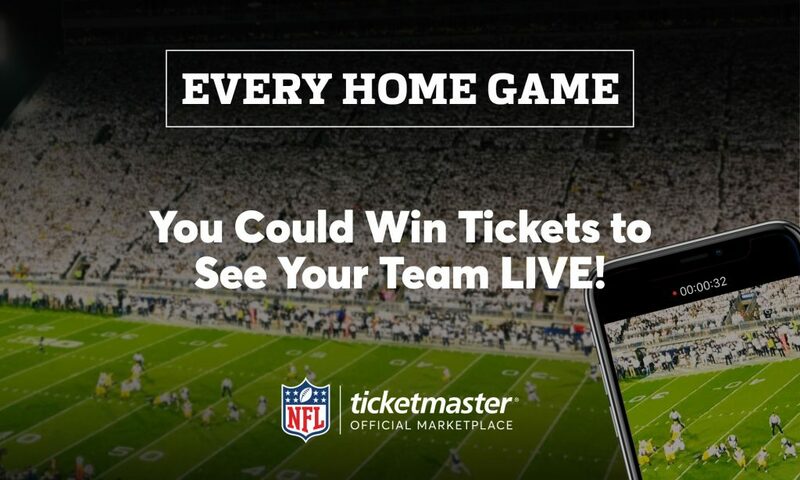 Ticketmaster wants to give you the chance to cheer on your favorite team live in person – ALL SEASON LONG. It’s simple: show us your stripes* and you could win a pair of season tickets to this year’s home games – one fan per every NFL team – courtesy of Ticketmaster. As the Official Ticketing Marketplace of the NFL, Ticketmaster is THE place to see your team play live – providing fans with the most options from the safest and most secure marketplace to buy, transfer, and sell tickets. Ticketmaster is with NFL fans every step of the way as 2018 marks League-wide adoption of digital ticketing, digital download / mobile ticket delivery, guaranteed ticket transferring, and tailored push notifications that can help fans with everything from parking to an assortment of helpful venue suggestions tied to their team. We can’t wait to see the creative and exciting ways you show love for your home team. Now… are you ready for some football? *NO PURCHASE NECESSARY. For alternate method of entry and complete details, click on your team’s name below. Each giveaway is open to legal residents of U.S. and Canada (except Quebec), 18+. Void where prohibited. Deadline to enter is 9am PT on 8/24/18. Winner must correctly answer a time-limited skill-test question if resident of Canada. Travel, parking, and accommodations not included. SPONSOR: Ticketmaster, LLC.